The FT-EV concept shows the size of the electric vehicle Toyota plans to offer. 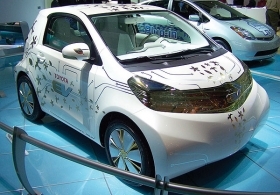 DETROIT — U.S. sales of Toyota's new electric vehicle will begin in 2012. Toyota is determining what platform and what model will be battery powered. Bill Reinert, national alternative-fuel vehicle manager for Toyota Motor Sales U.S.A. Inc., said Toyota is determining the new vehicle's range between charges. "We are wishing for the sky and making deals with the devil as [we] go down the road," Reinert said at the Detroit auto show. "We are looking for a 50-mile range right now" when such features as the defroster, heater, windshield wipers and stability control are operating at the same time. The front-drive FT-EV, a concept based on the small, two-door Toyota iQ, was displayed last week at the Detroit show with electric power. That concept shows the size of the electric vehicle Toyota plans to offer. The Toyota iQ is sold in Japan and Europe. There is no electric iQ. Toyota expects the electric production car to be used as the second or third vehicle in a household, primarily for urban driving. Reinert expects a charge will take about six hours using a 110-volt outlet or about two hours using a 220-volt outlet. The car will be powered by lithium ion batteries. Toyota still must decide whether the vehicle will be offered regionally or nationally when it is launched in 2012 and whether it will be available for purchase or through a lease, said John Hanson, a Toyota spokesman. Price and import volume for the first year have not been determined. Asked about the potential size of the market for electric vehicles, Reinert said it will depend on how fast and how extensive the infrastructure is put in place for recharging. He said other factors are battery development and consumer acceptance of vehicle range and recharging times.